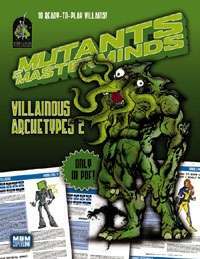 This 13-page Mutants & Masterminds supplement, written by Michael Hammes, details ten new villainous archetypes. Each features suggestions for variations of the archetype as well as a trio of capers appropriate for the villain. Alien Subjugator - coming to rule your world. Artificial Intelligence - coldly logical computer program. Cold War Relic - disillusioned supporter of the state. Corrupt Government Agent - you just can't trust the government. Cthuloid Horror - that which may eternal lie. Deadeye - anything's a weapon in her hands. Dead Man Walking - frighteningly powerful zombie. Estranged Sidekick - protÃ©gÃ© gone bad. Swarm - buzz, buzz, you're dead. Time Traveler - a danger in any time. The Demo button links to Mutants & Masterminds Archetype Archive 0. 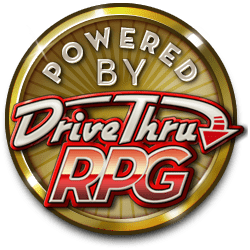 This publication presents the archtypes from the Mutants & Masterminds RPG in the style of the Archtype Archive series. This title was added to our catalog on April 20, 2006.